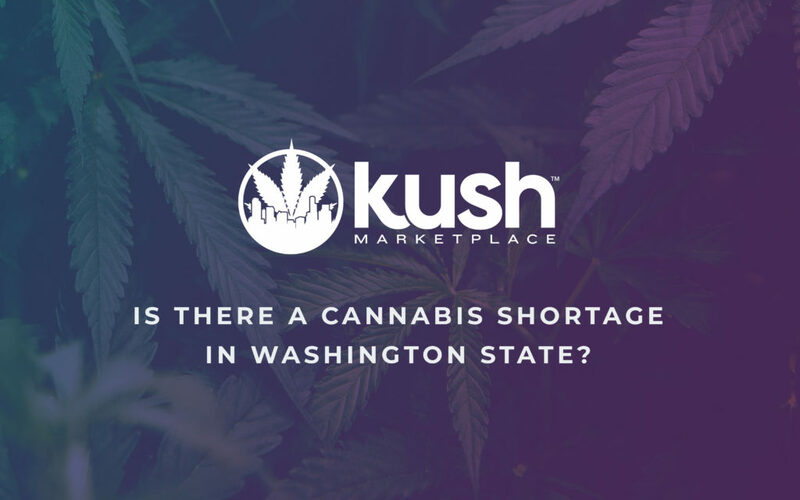 Is washington experiencing a cannabis shortage? It’s time, we’re officially calling it. The Washington Cannabis Market is experiencing a shortage in raw materials. This is the first time in a long time that you’ve heard those words used to describe the Washington market. We have had a suspicion based on hearsay in the industry, but we decided to dive into the data to see what was really going on. Below, you will find a chart featuring two data points tracked monthly over the past year. Both data sets were created by taking all of the product listings (1,778) and filtering down to listings with offers (627) and looking at what has been happening to them. The first data series (Orange) is the average # of offers per product. The second data series (Blue) is the average days it took for a product to receive an offer. Logic points to a shortage of supply due to additional pesticide testing. This additional testing has been a major issue since October of last year. Check out our last ‘Pesticide Update’ blog for more info. As represented in the second chart above, the gap is widest when it comes to flower. In March, we saw products get their first offer within 2 days, and receive on average 6 offers per product. Both stats were record setting on Kush Marketplace. Ultimately, there are many factors like seasonal trends and the growth of Kush that could help explain the shortage. Seasonality plays a major role as you can see in the charts above. During the winter there’s plenty of fresh outdoor flower to be found, but growing greenhouse and indoor becomes more expensive. Once you hit the 4/20 rush, retail buying increases, outdoor starts drying up, and there’s going to be less on the wholesale market. There might always be a rise in prices during this early spring & 4/20 season, but this year seems to be different. The self-imposed testing, along side everything else, might be to blame.. If there was a shortage, wouldn’t prices be going up? 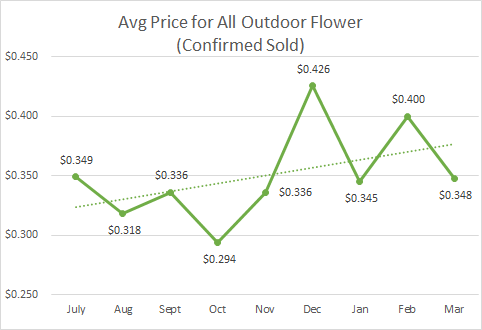 Our data shows a clear raise in general prices when looking at all flower, including everything from bag ready to untrimmed and untested. 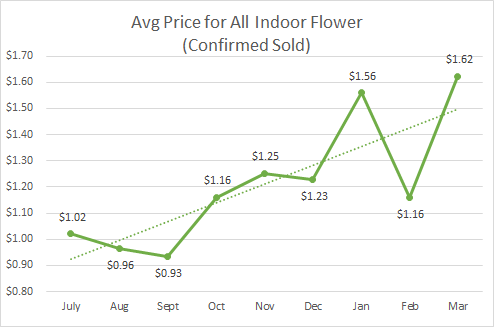 The largest growth being Indoor flower having an increase of over 50% since last July. We see some raise in prices / instability around the early 2019 months, but taking the data back to mid last year shows a clear upward trend that supports the idea of a supply shortage. One last factor to take in account is the growth of our Wholesale Kush Marketplace. In the last year we’ve been growing as a company, improving our website, and seeing a much higher volume of sales. Trends seen in the ‘Time to Offer’ charts could be a sign that we are improving in efficiency and effectiveness. Not only have we generally improved the site, but we’ve implemented features that should help sellers get the most out of their product. In many ways the ‘Time to Offer’ charts show the growth of Kush Marketplace and any trends could be partially driven by our continual improvement. Recently we’ve added an ‘Offers’ section, improved our internal messaging system with a major update to the conversation pages, and added a ‘buy now’ button (read about all the recent new features here). All of these changes could have decreased the days to offer and increased the total number of offers. We’ve confirmed sales of a lot of raw material in the last year (nearly 15 tons in WA). This alone could have an effect on the market. We’ve helped move more product faster than ever which we believe has significantly increased the efficiency of the market. With the increase of pesticide testing and greater efficiency, a shortage of material this year starts to look believable. While we can’t say we know for sure, our confidence that we’re in a raw materials shortage is pretty high. Be sure to login to the Kush Marketplace! If you’re a seller, now seems like a great time to post for all time high prices. If your a buyer, don’t get caught in a shortage!